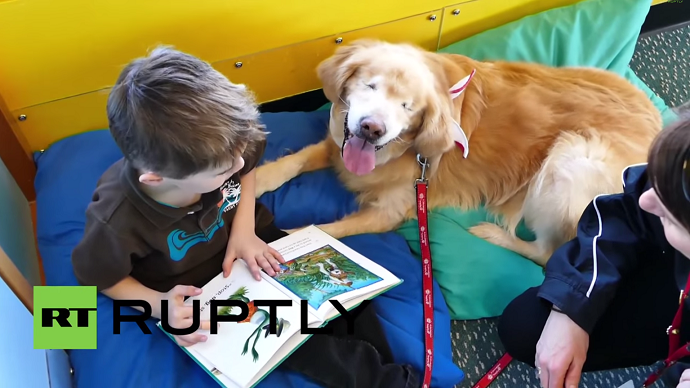 Meet Smiley, a blind 12-year-old therapy dog who helps children with special needs and brightens the days of nursing home residents in Stouffville, Ontario, Canada. The pooch was born without eyes, and with a condition linked to dwarfism that left him with physical disproportions. His eyes were sewn shut to prevent infection, so the dog looks as though he is always smiling. After rescuing Smiley from a puppy mill when he was one or two years old, dog trainer Joanne George had difficulties finding a home for the pooch – so she decided to adopt him. It didn't take George long to realize Smiley would make a perfect therapy dog, thanks to his kind interactions with people. Speaking to ABC News, she recounted that “there was this man Teddy, [he had] no speech, no communication at all,” and the staff had “never seen Teddy smile before.” But when Smiley arrived to the nursing home, Teddy “smiled when Smiley got into his vision,” she said. At the moment, Smiley works at St. John’s Ambulance, a first-aid training organization in the York region of Ontario. George said that Smiley visits a local library to spend time with children who have autism and experience difficulty with reading. She also takes the dog to visit children with other special needs.